I need to pick up South Florida IPT co-leader Denise Ippolito at the Tampa Airport at about 10:45am and then head down to Fort Myers Beach. I was asleep by 9:00pm but awake at 2:45, thoughts of the streak racing through my head. I had worked on the images for today’s blog post last night. Note: Many folks are taking advantage of the Late Registration Discounts to sign up for a segment here or a morning session there. See more by scrolling down here. I am again feeling a bit better today; thanks for all the good wishes. This post marks 59 days in a row with a new educational blog post, a record by far that should be extended for at least another week or two. Or not. 🙂 To show your appreciation, we ask that use our B&H and Amazon affiliate links for all of your B&H and Amazon purchases. 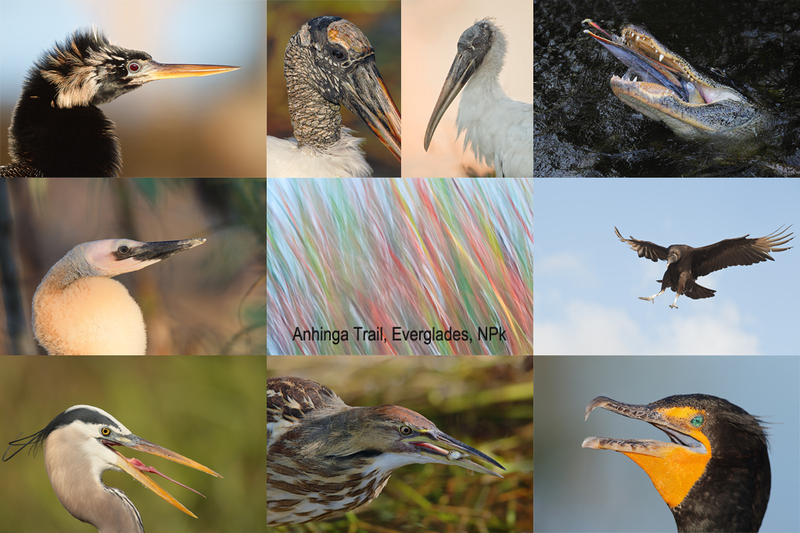 Please check the availability of all photographic accessories in the BIRDS AS ART Online Store. We sell only what I use and depend on. We will not sell you junk. We know what you need to make creating great images easy and fun. And we are always glad to answer your gear questions via e-mail. This Brown Pelican image was created in early morning light on the San Diego Short Notice IPT with the Gitzo 3532 LS carbon fiber tripod, Mongoose M3.6 head, the Canon EF 600mm f/4L IS II USM lens, the Canon 2x EF Extender III (Teleconverter), and the Canon EOS-1D X Digital SLR camera. ISO 400. Evaluative metering +1/3 stop as framed: 1/640 sec. at f/10 in Manual mode. Central sensor (by necessity) Expand/AI Servo/Rear Focus on the bird’s face was used to set the focus…. I was amazed when I noted that AF was not active at the moment of exposure with this image. Click here if you missed the Rear Focus Tutorial. Click on the image to see a larger version. The Vision and the Original. And my Dad. Ever since I have been photographing California Brown Pelicans in LaJolla, probably more than 15 years in all, I have been trying to create an image like the one above with the bill held relatively horizontal and the beautiful bill pouch distended, the reds and greens prominent. I had tried and failed many times. When I saw the image on the back of the camera I thought that I had a chance. I do not waste time enlarging images in the field…. Note: I started visiting San Diego in the early 70s when older daughter Jennifer was about a year old–my Mom and Dad moved there from Brooklyn in about 1969. They had visited the year before, and when Private First Class Robert E. Morris, a disabled American Veteran, got off the plane, he looked around at the palm trees and said, “We are going to live here.” My Dad–hit by 13 rounds of 70mm machine gun fire, was severely injured on Okinawa losing his right arm above the elbow and left with left arm hanging by a thread. After 19 months in the hospital, his left arm saved by a young Filipino doctor who was the only one against amputating what was left of his remaining arm–the elbow joint had been destroyed, he returned home to my Mom in Brooklyn. Eventually he went back to work at Roebling Luggage on Liberty Street in Manhattan as delivery boy and wound up pulling luggage off the shelves for more than 30 years. Then he retired to move to San Diego with my Mom and my younger sister Arna. He died in San Diego in September of 2001. 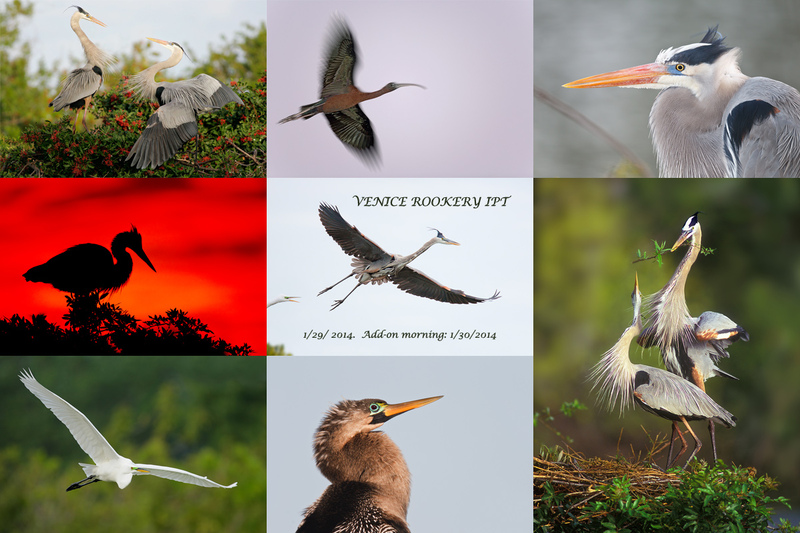 I began birding in 1976 and began photographing birds in 1983. 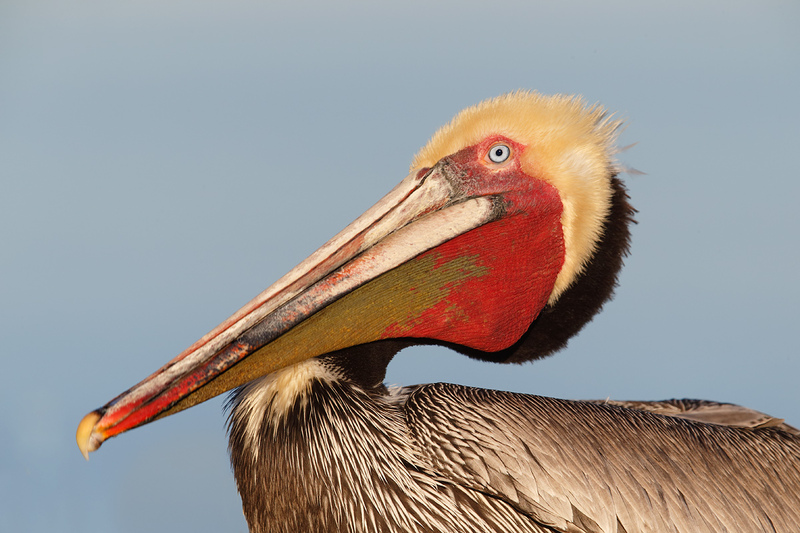 Though I visited San Diego and LaJolla annually each year beginning in the early 1970, it took me well more than two decades to learn exactly where and when to be to photograph the gorgeous pelicans…. When I saw that the nictitating membrane was completely covering the bird’s eye I realized that I had some work to do. And I was not too thrilled with the pelican in the background or the fact that my subject looked as if it had been hit in the head near the base of the bill with a claw hammer as there was a chunk of feathers missing there. More work. 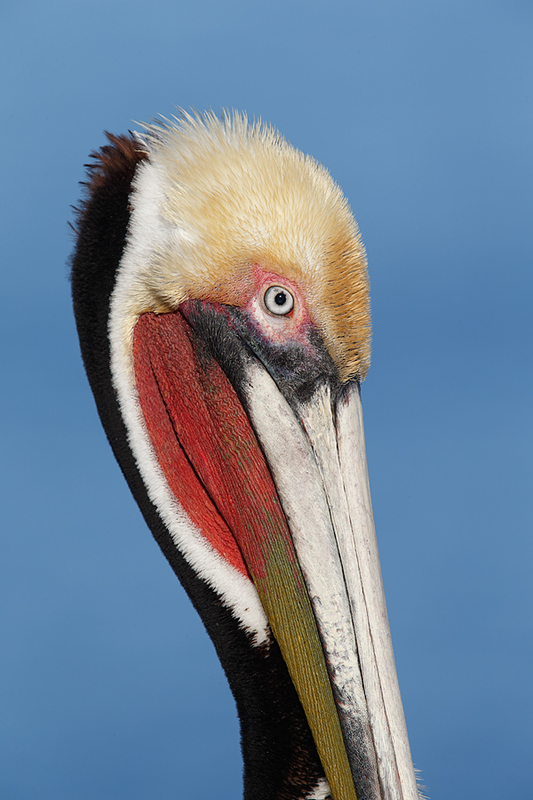 This Brown Pelican image was also created on the San Diego Short Notice IPT with the Gitzo 3532 LS carbon fiber tripod, Mongoose M3.6 head, the Canon EF 600mm f/4L IS II USM lens, the Canon 2x EF Extender III (Teleconverter), and the Canon EOS-1D X Digital SLR camera. ISO 400. Evaluative metering +1/3 stop as framed: 1/500 sec. at f/13 in Manual mode. This image was created 25 minutes after the image that opens this blog post. Central sensor (by necessity) Expand/AI Servo/Rear Focus on the base of the bird’s bill was active at the moment of exposure. Click here if you missed the Rear Focus Tutorial. Click on the image to see a larger version. All that I needed was a nice eye with a nice sharp iris and a nice sharp pupil. The original was created at 7:37am and I did not have another image of the same bird. But I figured that the eye of the pelican in the image above would work as I only needed the iris and the pupil. It could be done. So I did it. This, the optimized image, was created in Photoshop CS-5 from the image that opened this blog post after the RAW file was converted in Canon Digital Photo Professional. Note that the eye here looks a lot better than the eye in the source image…. My first chore was to replace the eye. I painted a Quick Mask of the eye and the eye skin from the source vertical, placed it on its own layer, and moved (V) that layer roughly into place on the original. I flopped the layer horizontally and added a Regular Layer Mask. I rotated the layer with the opacity reduced to about 65% and the eye skin still intact so that I could ensure that the angle of eyeball was correct. Then I hit Control T (Transform), adjusted the size, and then did some extensive warping so that the shape of the eyeball was correct. All was good but for the fact that the pupil was not properly positioned. After erasing all of the eye skin and leaving only the eyeball I created a new Quick Mask of the pupil with a good bit of the iris surrounding it. After putting that on its own layer I was able to correctly position the pupil. I added another Regular Layer Mask to fine tune the selection, flattened it, and used a 60% Clone Stamp Tool to clean up the somewhat messy pupil. The above took about 20 minutes but I was very happy with the result. I used a Quick Mask of the sky with a Regular Layer Mask added for fine-tuning, and used a series of small Quick Masks to cover the gash on the front of the head. I used both the Clone Stamp Tool and the Patch Tool to do some general clean-up work in various spots on the bill and the head and face. I selectively sharpened the distal end of the bill with a Contrast Mask as I was a bit short of depth-of-field there. After checking for dust spots–that should have been done first :), I used one of the APTATS II tutorials to move the bird a bit back in the frame. Nearly all of the above is as detailed in my Digital Basics File, an instructional PDF that is sent via e-mail. It includes my complete digital workflow, dozens of great Photoshop tips, several different ways to expand canvas, all of my time-saving Keyboard Shortcuts, Quick Masking, Layer Masking, and NIK Color Efex Pro basics, my killer image clean-up techniques, Digital Eye Doctor, and tons more. You can learn Advanced Quick Masking Techniques (the Transforming and Warping) in APTATS I. Mention this blog post and Jim will be glad to apply a $5 discount on your APTATS I purchase with phone orders only. The moving the bird back in the frame technique is one of several tutorials detailed in APTATS II. Mention this blog post and Jim will be glad to apply a $10 discount on your APTATS II purchase with phone orders only. Order both to hone your Photoshop image clean-up skills and Jim will be glad to enter a $15 discount for the pair, on phone orders only. 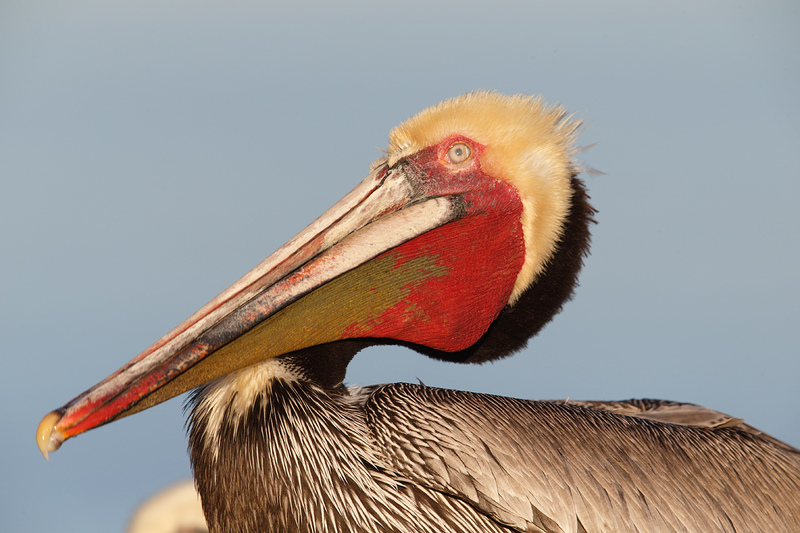 The original image showed a somewhat disheveled pelican with its bill distended. The optimized image showed a rather handsome pelican with its bill distended. Will I be entering the image in question in the BBC Competition? No. I clearly went beyond what they allow. Do note that this image would be right on the borderline of acceptability in the BAA Contest with its much more liberal digital guidelines. If what I did is not something that you would choose to do with your images, I am fine with that. And I am quite proud of the Photoshop work that I did here to transform a pelican image that was bound for the trash heap to one that would look pretty good on the wall. If you have the urge to post a commenting here stating that what I did was wrong, please instead visit www.PassingJudgementOnOthers.com. A BAA Site Guide is the next best thing to being on an IPT. And they cost only fifty bucks; a lot less than an IPT or other photo tour. You can learn about our 14 great Site Guides by clicking here. 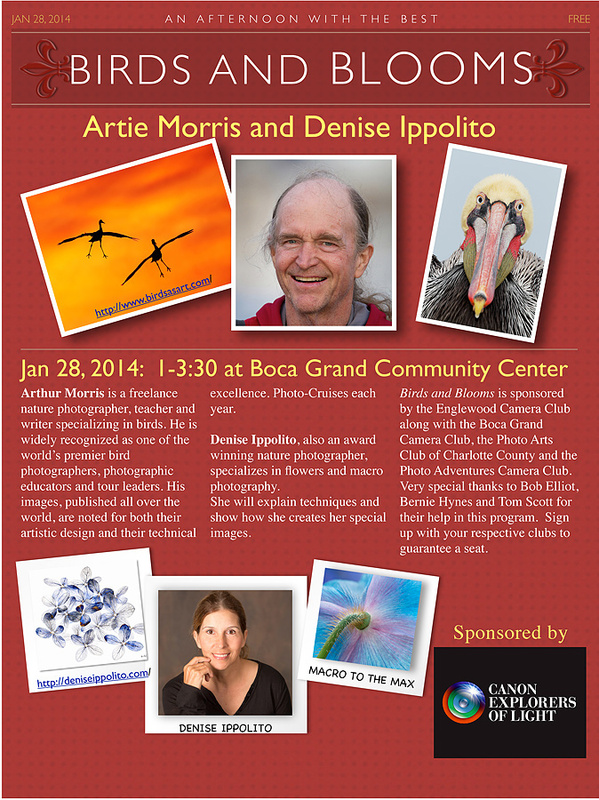 See especially the San Diego Site Guide if you will be visiting San Diego to photograph birds–best in winter. What’s unethical. You’ve told the viewer exactly what you did to create the image and have not tried to pass it off as something other than an image you created. It’s a beautiful image. One thing I do notice between the original and the final version is that the tip of the bill looks a little different (it looks like you cleaned off the reflection of light). In the final image the tip of the bill looks dulled; I actually like the tip of the bill in the original a little better. By the way, that second image is also great. Thanks for all your hard work on the blog Artie, I think your pelican is superb . 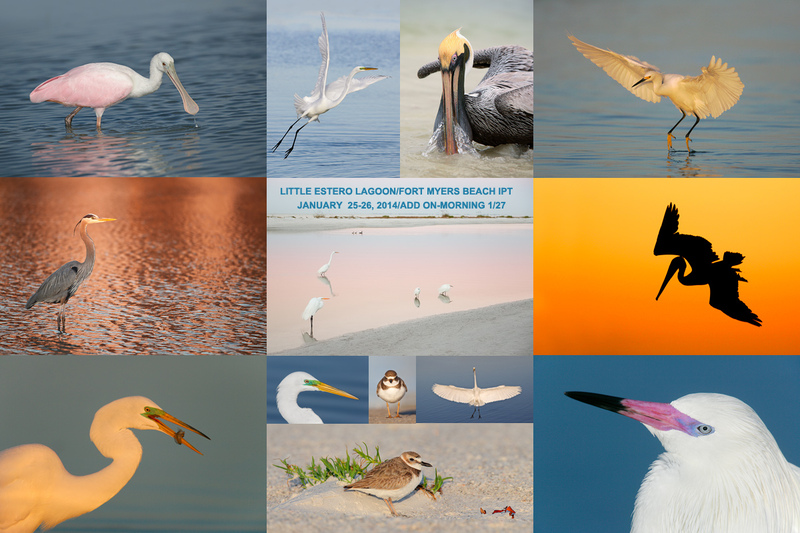 Bring your warm clothes to Little Estero Lagoon. It is cold down here!! I’ve been meaning to ask you, do you notice a difference in the amount of background blur between using the 600 with 2x extender vs the 800 with 1.4 extender? After reviewing the 800 + 1.4 extender images on your blog, it appears that they have a stronger blurred background. I realize that many factors affect this and that technically the amount of blur should be the same (at the same aperture), just wanted to hear your thoughts.